We’re still working hard to add more features to Goodbudget! If you’d like to hear updates, we’ll be posting on our blog, Facebook, and Twitter as we release new features. Thank you. I will give the new website another look. When looking at this page… https://www.goodbudget.com/blog/ each post only has a time stamp, no date stamp. @Tony, thanks for catching that! We’re working on a fix to show the dates and it should be rolled out soon. I am so glad this feature is back. I have a zero based budget system so unallocated income doesn’t exist in my world! Question though, I have used this feature to create a few scheduled incomes. I have different envelopes I use for sweep envelopes other than unallocated. The initial envelope fill worked great but when I look at the scheduled upcoming incomes, the sweep envelope went back to unallocated. I tried changing it and clicking update but it still goes back to unallocated. Is it going to work correctly in the next time there is a transaction? @Erin, I’m glad you like the feature! And it sounds like you’ve run into a display bug when you open the transaction the next time. If you click ‘Cancel’, the Fill will run correctly next time with your original sweep Envelope, even though you saw ‘Unallocated’. If you click ‘Save,’ however, it will then save ‘Unallocated’ as the sweep, so you’d need to re-choose your sweep to avoid problems. This bug is on our list of things to fix! I already have “fill from unallocated” set up and scheduled for bimonthly paychecks. Is there an easy way to change it to “fill from income” without starting over from scratch? @Jason — unfortunately, no. Once you’ve saved a fill, it’s not possible to convert from one kind to the other. How do you distribute money from Unallocated to an envelope? Also, how do you transfer money from one envelope to another? @Brittany, To distribute money from Unallocated, click on Fill Envelopes. By default, this will use money from Unallocated and distribute it to your Envelopes. You’ll see “Fill from… Unallocated” in the summary on the right. To transfer money from one Envelope or another, click Add Transaction, then choose the Transfer tab. Correct me if I’m wrong, but I can still only fill from income to one envelope, right? If I get $200 and want $100 to go to groceries and another $100 to go to savings, can I still do that in one step? It doesn’t appear I can. Never mind. I see it works now. Thanks! We’re glad you were able to fill all of your Envelopes with your income through Fill From…New Income. For those reading in, you can fill all of your Envelopes using the Quick Fill dropdown menu or just type in an amount for each Envelope you’d like to fill. How do you change the initial envelope fill? 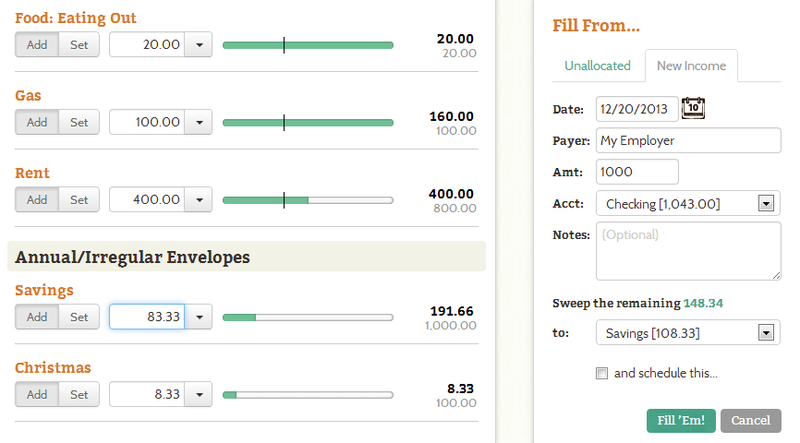 To edit the Initial Envelope Fill, just go to your transaction history and select the transaction–you’ll see the Fill Envelopes page and edit how much you’ve added to each Envelope and fill any new Envelopes you’ve created since then. Going forward, you’ll create a new Envelope Fill for each income or budgeting period by clicking on the “Fill Envelopes” icon. Email support@goodbudget.com if you have a specific question about your Household and we’ll be happy to help you! I am confused about what the initial envelope fill is. I just signed up a few minutes ago. Thanks! Hi Danielle – If you just created your budget, the Initial Envelope Fill represents the amount of money that was needed to fill up your Envelopes. You can think of it as an income that was used to fill your Envelopes directly. You can edit that fill by clicking on it while in your Transaction History. If you have more questions, feel free to shoot us an email at support@goodbudget.com. Thanks! I’m trying to transfer money from one envelope to another but I don’t see a transfer option as mentioned in the above comments. Hi Amanda – If you’re on iPhone, tap on More > Envelope Transfer. If you’re on Android, tap on the Overflow Menu > Envelope Transfer. If you’re trying to transfer funds to or form Unallocated, you’ll have to do so on the website. You can do that by clicking on Add Transaction > Transfer. Hope this helps!